Andrew Williams at his first campaign announcement in 2009. In his 2009 campaign announcement, Williams said he has lived in Albemarle, Louisa and Fluvanna Counties. He only registered to vote in Charlottesville shortly before entering the campaign. Williams failed to qualify to be on the ballot by the June 9, 2009 deadline when he submitted only 93 of 125 qualified petition signatures. Williams announced on June 10, 2009 outside City Hall that he would continue his campaign as a write in candidate. During 2009 he also applied for an open seat on the Charlottesville Planning Commission. 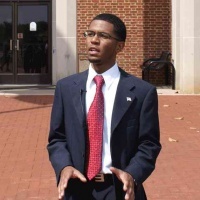 Andrew Williams is a student at Piedmont Virginia Community College and a full-time employee of State Farm Insurance. He has filed the paperwork to become a candidate, according to City Registrar Sheri Iachetta. Williams made his announcement outside of City Hall on May 13, 2009. At his campaign announcement, Williams said his youth would allow for a “new perspective” on City Council but said he understood that his independent campaign would be an “uphill battle.” He pledged to visit all 8 of the City’s precincts to build a grass-roots campaign dedicated to the interest of “students and their families” as well as the working class. Acknowledging that his campaign is in its infancy, Williams said he would be listening to voters in order to develop positions on the issues facing the City. He said public safety will be a major theme of his campaign. A further statement from his campaign regarding his positions will be issued within the next two weeks. ↑ Web. Another candidate announces for City Council, Graham Moomaw, Daily Progress, World Media Enterprises, May 29, 2011, retrieved May 31, 2011. ↑ "Interview with Richard E. Sincere, Secretary, Charlottesville Electoral Board." Telephone interview by Brian A. Wheeler. Charlottesville Tomorrow. 10 June 2009. ↑ Wheeler, Brian A. "Williams fails to get on ballot for City Council; Running a write-in campaign as the ‘fifth candidate’." Weblog post. Charlottesville Tomorrow News Center. Charlottesville Tomorrow, 10 June 2009. Web. 10 June 2009. <http://cvilletomorrow.typepad.com/charlottesville_tomorrow_/2009/06/williams.html>. ↑ 'Independent Andrew Williams enters City Council race '. 13 May 2009. Charlottesville Tomorrow. 15 May 2009. This page was last edited on 10 October 2018, at 19:39.